Let's talk about brazil nuts for a second, shall we? There was a time when I really liked them! When I was younger, I'd always pick brazil nuts out of the mixed nut canister first. They were so big and so few in each container, that I needed them all for myself. Then there was a time later on, when I hated them. Don't know what changed- I just didn't enjoy the taste, what-so-ever. Well here I am, eagerly trying to heal my body of a thyroid autoimmune disease and researching ALL THE FOODS and I stumble upon the darn things again. But this time I'm intrigued- they're actually really, really good for you! Like...REALLY. Not only that, if you struggle with any thyroid issue, they contain a heap load of selenium which is AMAZING for thyroids! Hurrah! So allow me to tell you what these little big nuts really can do for you! One ounce of Brazil nuts contains 185 calories, 4 grams of protein, 3 grams of carbohydrates and 2 grams of fiber. They provide 5 percent of the RDA for calcium and 4 percent for iron. They are packed full of healthy fats (which is still a fat, so keep it to a serving) which can help to promote heart health and like I said earlier- include an amazing amount of selenium (774 percent of the daily recommended value of selenium to be exact). Selenium is a trace mineral essential to immune and thyroid function. Brazil nuts also include magnesium, copper, manganese, zinc, vitamin E, potassium and riboflavin. Phew! Thats a pretty hearty nut, eh? So anyways, I've fallen in love with the thing, all over again. I always have them on hand, and sneak a few here and there whenever I find myself needing a little snack. 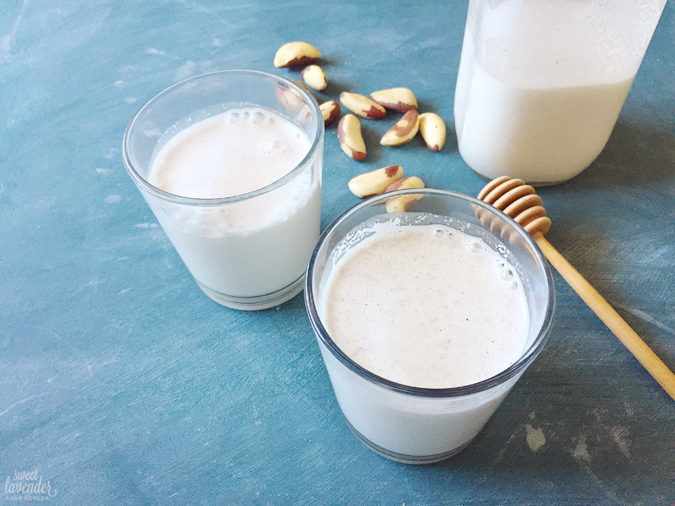 Not only that, but just like almonds, cashews, hazelnuts, etc, Brazil nuts make a pretty yummy (and also nutritionally dense) milk! This is such a simple way to keep a little boost of vitamins and minerals on hand. Great on cereal, oatmeal or added to smoothies! 1. Add raw nuts to a bowl and cover with filtered water so that they are completely submerged. Set aside on the counter, covered for 12 hours. 2. Once soaked, drain and rinse nuts thoroughly. Add drained nuts to a high speed blender and top with 4 cups fresh filtered water, raw honey and vanilla extract, if using. 3. Blend on medium for 30 seconds and then high speed for 2 minutes more. 5. Store container (with lid) in fridge for up to one week. Give milk a little stir before serving.